Steel cut oats have been a trendy food item for a while now, and with good reason. They have a lower glycemic index, which is good news for diabetics. They are also pretty tasty, more flavor than rolled oats and a chewy texture that many people find appealing. They are pretty easy to make, as well. Not quite instant, but you can have a hot bowl of steel cut oats in just over a half-hour. While a bowl of steel cut oats with a little salt and brown sugar is very nice, you can do more with them. This is a pretty easy recipe that you can do much of the prep work for the night before, then pop it in the oven for an hour for a nice, hot, and delicious breakfast. ½ cup almonds, slivered are fine. - In a bowl, mix together the oats, almonds, baking powder, cinnamon, and salt. - In another bowl, whisk the milk, maple syrup or brown sugar, egg, butter, and vanilla. Pour the milk mixture over the oat mixture and stir to combine. - Put in refrigerator, covered, overnight. - Next morning, preheat oven to 375. 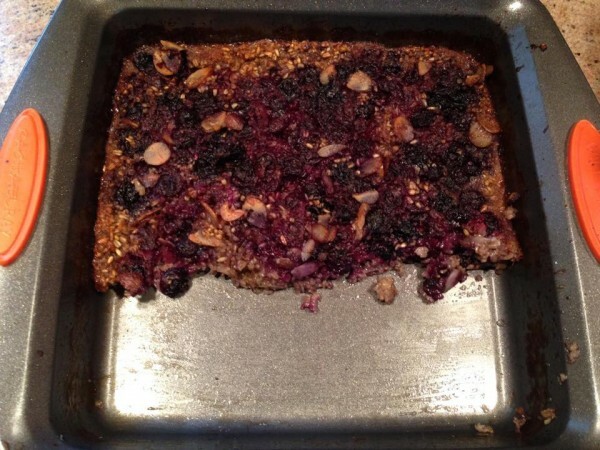 - Add and spread out blueberries in a lightly greased, 8-inch baking pan. - Pour mixture over blueberries, and stir a bit to make sure all the ingredients are evenly distributed. - Place pan in middle rack. - Bake for 45-60 minutes (but check after 30 minutes to make sure it isn’t browning too quickly, if it is, turn down to 350 for rest of baking time). - Remove from oven, let set for five minutes. - Cut into six squares and serve.